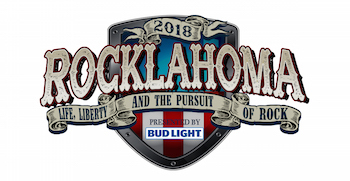 Music performance times and onsite experiences have been announced for Rocklahoma, presented by Bud Light, May 25, 26 & 27, 2018 at "Catch the Fever" Festival Grounds in Pryor, Oklahoma, just outside Tulsa. America's Biggest Memorial Day Weekend Party celebrates its 12th year with performances from top rock artists including Poison, A Perfect Circle, Godsmack, Cheap Trick, Ghost, The Cult, Halestorm, Vince Neil, Stone Temple Pilots, I Prevail, Clutch, The Used, Underoath, Machine Gun Kelly, Cinderella's Tom Keifer and many more. The three-day camping festival features the best new rock artists and classic bands performing on four stages, with music going all night long. The weekend kicks off with the annual Rocklahoma campground party. As you're rocking out at Rocklahoma, make sure you grab some cold Bud Lights. With Bud Light, you're not just drinking beers, you're building friendships. We can't wait to return to the country's biggest music festival! Share your Bud Light Music Moment with us! Stop by the Monster Energy viewing deck to refuel and meet some of your favorite Rocklahoma artists! Monster Energy will be keeping everyone fueled up and ready to rock by offering free sampling on their Monster Energy viewing deck. Enjoy Monster Energy drinks from one of the best seats in the house. Make sure to check back throughout the festival for a schedule of Monster Energy's interactive artist experiences. Most companies spend their money on ad agencies, TV commercials, radio spots and billboards to tell you how good their products are. At Monster Energy, we chose none of the above. Instead we support the scene, our bands, our athletes and our fans. We back athletes so they can make a career out of their passion. We promote concert tours, so our favorite bands can visit your hometown. We celebrate with our fans and riders by throwing parties and making the coolest events we can think of a reality. Zippo Encore will be back in action at Rocklahoma with a full stock of Zippo lighters, including the limited edition festival designs! Come by and spin their wheel for great prizes, enter their Zippo Custom art contest, and get your Zippo lighter filled for free. Be sure to go see them early every day, you could get access to some of the best "seats" in the house, the Zippo Hot Seat! River Spirit Casino can't wait to rock out with fans at Rocklahoma 2018! Stop by our Rocklahoma Courtyard to kick back with a cold drink & enjoy the River Spirit Casino Stage artists. The brand-new River Spirit Casino and Hotel is Rocklahoma's official Play & Stay destination! Don't miss a favorite Rocklahoma tradition, the Miss Rocklahoma Pageant, brought to you by D&B Processing. See the 2018 winner crowned at 5:10pm on Friday night at the Bud Light Stage. SWFTCharge provides an ultra convenient phone-charging service for live music events. How it works: attendees purchase the charging service at one of the SWFTCharge booths and receive a "SWFTCharger" to charge their phone. Once the "SWFTCharger" is dead, it can be swapped for a new one as many times as customers want while they are at the event. By eliminating charging pads, wires and lockers we're aiming to provide attendees with a service that is convenient, frictionless and untethered. With onsite camping amenities and unparalleled VIP packages, Rocklahoma lives up to its motto of "Life, Liberty & the Pursuit of Rock." In 2017, Rocklahoma had its biggest year ever, with over 75,000 in attendance. Fan voting for the annual Miss Rocklahoma competition has ended, and the Top 5 finalists have been chosen. The winner will be crowned Miss Rocklahoma 2018 onstage at Rocklahoma on Friday, May 25 at 5:10 PM. Rocklahoma General Admission and VIP tickets, as well as Premier Packages, Hotel Packages and Camping options, are on sale now. Limited quantities of Groupie and Roadie VIP Packages are also still available. The Rockstar Package is SOLD OUT. Please visit http://rocklahoma.com/tickets.html for details. General Admission and VIP camping is also available at checkout, by calling (866) 310-2288, or emailing info@rocklahoma.com. Rocklahoma is supported by our rockin' partners, including Bud Light, Monster Energy, Zippo, River Spirit Casino, D&B Processing, SWFTCharge, Chevrolet, Island Noodles, F*ck Cancer and more.